Approach Lambeth Town Hall from the north and it looks like a typical Edwardian edifice straight out of the golden age of municipal architecture – all classical pillars, red brick and Portland stone, with a 130ft tower topped by a grand clock. Once inside the 110-year old Grade ll listed building, though, it is very different: cool, airy and spacious, a subtle combination of the traditional and the modern. The effect is the result of a multi-million pound project to transform this south London borough’s offices, bringing them up to date and creating a user-friendly environment while also making the council’s built assets more economically efficient. Going back to its inception five years ago, the project led by main contractor Morgan Sindall Construction & Infrastructure has brought 14 offices scattered throughout the borough into one area in the centre of town just a couple of minutes from the local Brixton tube and rail stations. The aim was to create a suite of buildings suitable for a 21st century organisation delivering a complex set of services for the 324,000 local residents. At a total cost of £82m, as well as the revamped town hall it also includes a new state-of the-art civic centre with a large walk-in ground floor reception area, six stories of open-plan office space and meeting rooms and landscaped public areas. Next to the town hall, an Art Deco block which was originally a Co-Op store has been transformed into a set of high-spec apartments. Entering the town hall, the area immediately inside has been opened up to create a light-filled atrium with a connecting bridge to the reception area, with corridors off to various council departments. All is muted and modern but retaining many traditional features recalling the building’s history. The council’s coat of arms with the motto ‘Spectemur agendo’ – let us be judged according to our conduct – is proudly on display as well as striking artwork by local artists. The doors are painted in their original green colour, recreated when the layers of paint built up over the years were chipped off and analysed. Picturesque stained-glass windows have been restored. Some of the workings showing where beams have been removed have been left to emphasise the building’s history. The assembly hall has been restored with all the original woodwork French polished and the wooden flooring brought up to a high standard. Now used mainly for public meetings, it has a colourful history in which rock stars and actors figure prominently. Downstairs at basement level in the three-sided ‘Tripod’ area the atmosphere changes and the decor becomes more industrial. Here, local entrepreneurs have been provided with workspace to develop their businesses and help grow the local economy. The place is humming with activity. The town hall project was logistically complicated given its location on a busy crossroads in central Brixton. The original structural frame was concrete, though steelwork was added during repairs to war damage in 1948. Its age and history meant 80 surveys had to be carried out in the nine-month tender process. The building was a rabbit warren of corridors and more than 150 rooms, while the new configuration has created an open-plan environment. The entire mechanical system was replaced with 6km of new copper pipework. Many of the heritage features were timber, such as the voting booths in the council chamber. To counter the danger of them shrinking during the winter months of the two-year project, temporary heating was ducted around the site. The town hall has been linked to the new civic centre by means of a new paved courtyard including ground-level roof lights which illuminate the committee room in the basement below. The rear of the old town hall has been stripped back to its original 1908 facade and scenic lifts provide access to the upper floors. The courtyard is quiet and picturesque, despite being only a few paces from Brixton’s busy streets, and incudes the borough’s welcoming register office. The new civic centre comprises 11,500 m2 of office space in a six-storey, post tensioned concrete frame, sitting on 195 rotary piles, 750mm and 450mm in diameter, the deepest driven to 28m. The internal pillars were kept to the minimum to provide a flexible space and, along with other features, are constructed of concrete coated with a sealant to provide aesthetic and noise-reducing properties. The depths of the floor slabs ranges from 250mm to 300mm and the frame used almost 4,000 m3 of concrete, weighing 10,000 tones. It includes two structural stair cores with in-situ walls. Structural steel for the roof, manufactured in Germany, was installed using a 300-tonne mobile crane over a weekend. At its peak the on-site workforce reached 500, of which around 15% of the labour was from the local community. Inside the new building there is an air of business hustle and bustle. The main entrance is open to the street so people can walk in, creating an atmosphere of openness and welcome. Once inside visitors are dealt with by a team of meeters-and-greeters who direct them to the relevant desk for immediate help. The feeling of openness is emphasised by a magnificent 30-metre high curtain wall of specialist electrically-charged ‘intelligent’ glass that changes its tint to control sunlight and glare. 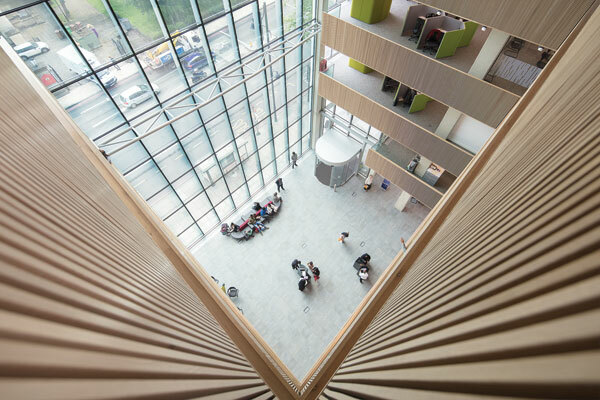 State-of-the-art air conditioning along with secondary glazing helps reduce noise from the street as well as making the building more energy-efficient and comfortable for visitors and the 1,800 people who work there. Ascending to the top floor by means of the quiet and efficient lifts there are views of London on all sides. Council staff ‘hot-desk’ in purpose-built workstations and meeting rooms. 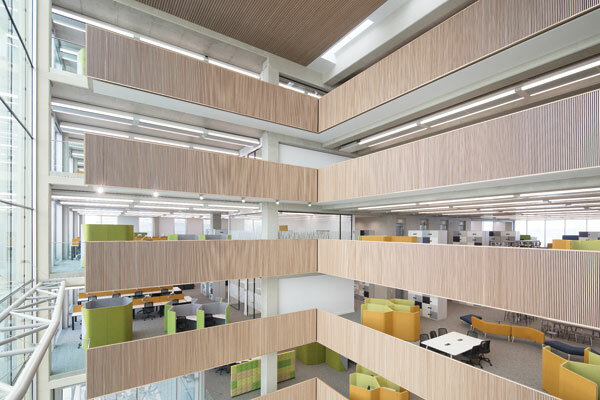 Throughout, slatted wooden facings backed by acoustic boards reduce noise levels to an acceptable workaday thrum. The old and the new brought together in a project to create the efficient, welcoming and stylish town hall of the future: in Lambeth the impressive result is there for all to see. From income generation to new funding models, Stephen Edgar outlines how directors can future-proof their public estate.